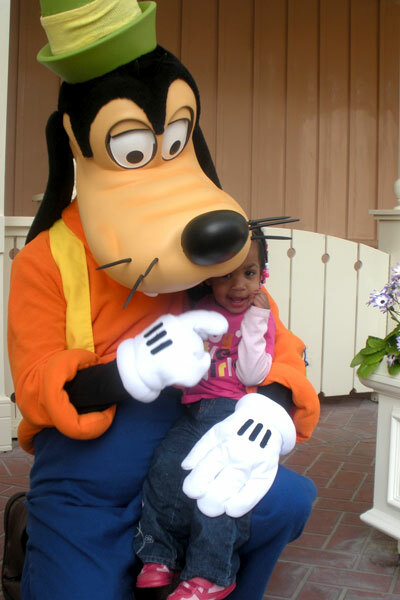 Last time we went to Disneyland, we were sure that Zoe would love all the characters. We were wrong; she was terrified. This trip, we didn't even think the characters were an option because we knew she would hate them. Again we were wrong. It all started while we were waiting for our Splash Mountain fast passes. 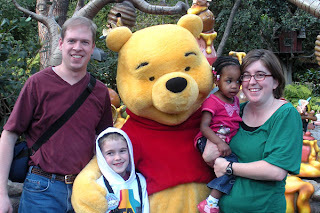 We needed to waste some time, Pooh was right there and had a short line, and Zoe has recently been really interested in him, so we decided to see what would happen. 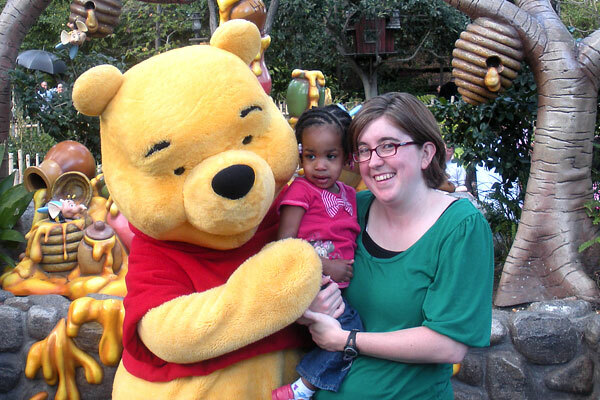 She was tired and crying while we waited in line, but when we got up to Pooh, he rubbed her cheek with his hand, and she immediately stopped crying and started grinning. She played with his nose and talked to him, and didn't cry again, until we made her walk away. 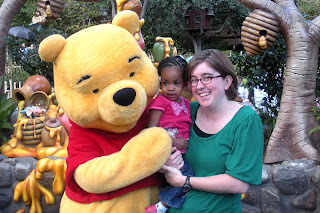 The rest of the day she wouldn't stop talking about Pooh and kept asking to look at the camera and see the pictures with him. 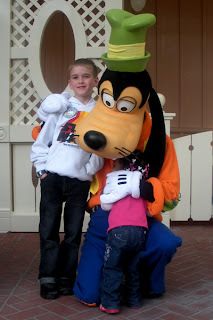 On our last day, as we were walking down Main Street, we decided to stop and see Goofy. Zoe was so excited. It killed her to wait for her turn in line. When it was our turn, Robby went and dutifully stood beside Goofy for a picture. Zoe ran right up to him and gave him a huge hug. 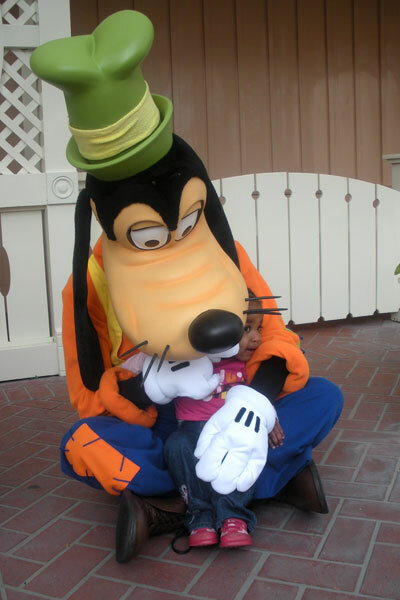 Goofy picked her up and sat her in his lap. She just couldn't stop looking at him. She was fascinated. Zoe sat and played with Goofy for quite a while and the line behind us was starting to get kind of long, so I told her it was time to go. She just kept saying, "no, no" and crying. So, Goofy, sat down on the ground and put her in his lap. They sat and played for a while longer. It was so cute. I eventually had to be the mean mom and make her leave. She was not at all happy with me. As we were walking away we saw Mickey and Minnie together. They had a pretty long line. I normally wouldn't even think about waiting in any kind of line to see a character, it has always seemed like such a waste of time to me, but she was so excited when she saw them and we decided it was worth it. We sent Robby and Grandma to ride on some big rides, and got in line. 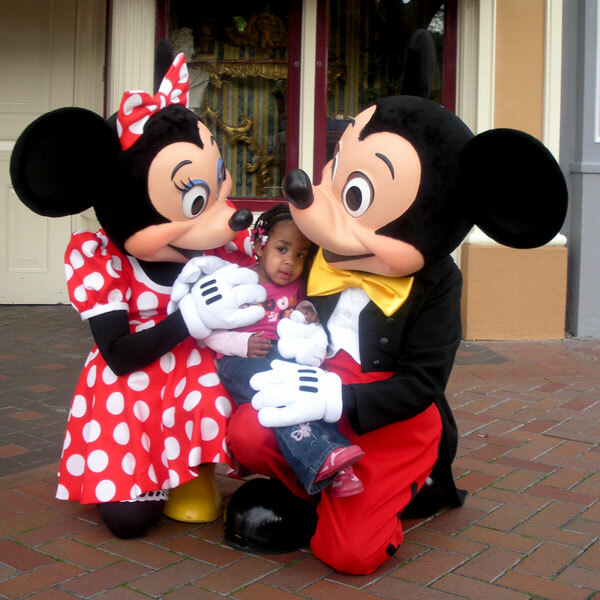 We wised up with Mickey and Minnie and took some video to try and really capture the cuteness. Unfortunately, the video doesn't do the moment justice. We just couldn't get at the right angle to capture the way she just snuggled right into them, the eskimo kisses that Minnie gave her, or the way that every time I started to convince her to leave, they would pull her back for one more hug because they thought she was so cute. My favorite part was when I finally decided it was time to go and started pulling her away. 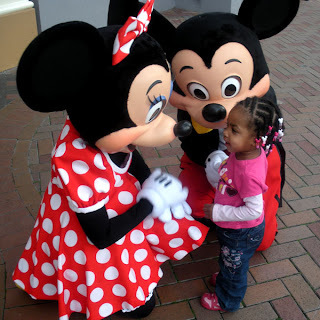 She started crying and Mickey and Minnie both pushed me away, telling me that they would just keep her. She was with them for quite a while (longer than the video clip). Eventually we had to leave, to the great protests of Zoe. I honestly think she would have sat there all day, snuggled into Mickey, if we would have let her. I think that Mickey and Minnie would have sat there all day with her too, if it was not for the line of impatient and tired people waiting behind us. 1. Those characters are truly amazing. 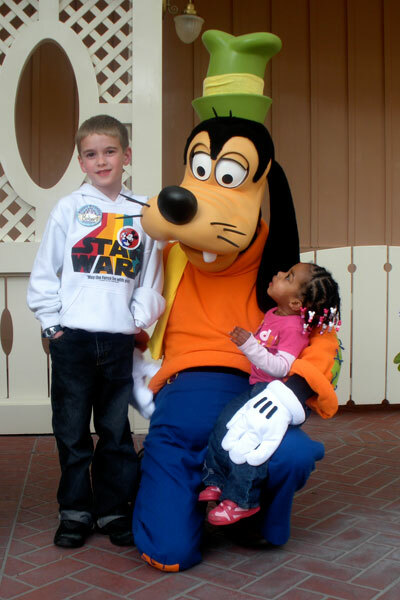 I always knew that the characters at Disneyland were good, but all four of them on this trip were truly magical. They were so good with Zoe. They seemed to genuinely enjoy spending time with her. We weren't at all rushed (in fact, I think they all spent more time with us than they should have), they knew exactly what to do to make Zoe happy, and they were amazingly sweet to her. I would imagine that it gets tiring, dealing with kids all day, but I do have to say, they were awesome. 2. I love seeing my kids happy. Those few minutes with those four characters was by far, the best minutes of my trip. Zoe was so absolutely happy and that made me absolutely happy. She won't stop talking about it. In fact, one of the first things she told me this morning, three days after the trip, was "Minnie, kiss." I am so glad she got to enjoy that moment. 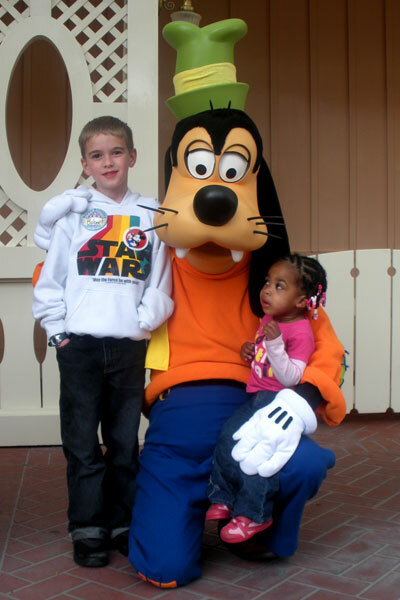 That is why I love Disneyland so much, seeing the magic through the eyes of my kids, and why I can't wait to go back again. That is just so sweet. I feel bad for the characters...none of them wanted to let her go. If there hadn't been a crowd, I don't think you would've ever gotten her back. 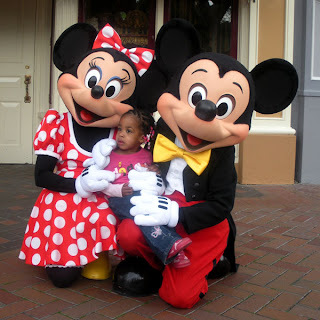 I can't believe she loved Mickey and Minnie so much! I'm sure Dorian would have been terrified. That is too cute. I'm glad you got it on video.